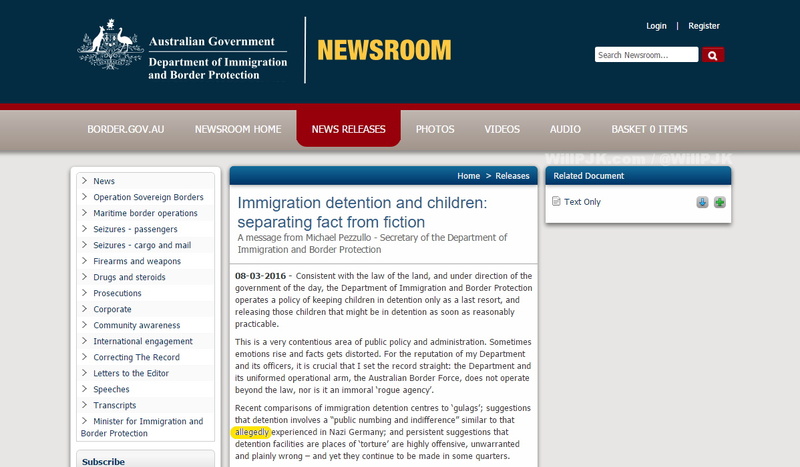 In what I sincerely hope was a moment of paranoid illiteracy, Department of Immigration and Border Protection secretary Michael Pezzullo has implied the former fascist leader of Germany may not have sought to use detention as a form of dehumanisation. That’s right, “allegedly.” The word is used far too often in news and opinion writing to lessen chances of a lawsuit, but it’s hard to believe someone thinks Hitler will take them to court. For starters, you cannot defame the dead. Secondly, if SBS’s abundant World War II documentaries have taught me anything, there is little doubt surrounding Nazi Germany’s dehumanisation program. It’s no wonder the claims continue when Border Force gives Hitler an out while trying to say it’s not fascist. Pezzullo wrote the piece because, “for the reputation of my department and its officers, it is crucial that I set the record straight.” The likely-typo might have done just that. It’s worth remembering that Germany is today among the most compassionate countries in Europe when it comes to supporting desperate refugees. Australia, however, focuses on a small number of Christian refugees while still clinging to the White Australia Policy. It’s articles & observations like this that justify why I follow you.